Every house has its quirks, especially if it is an old house. When you recently move into a home, whether it is a new build or an older home, you need to familiarize yourself with the house and its quirks, so that you can identify qualities about it that could be dangerous. Especially older homes may not be up to code and could present a risk of inflammation and potentially require fire damage restoration. Here are some ways to prevent potential fires in your home. One of the first places that a firefighter will look for the cause of a fire is the electrical panel. This is because, in older homes especially, electrical panels could be outdated and not done to code. Permits and building restrictions were much looser several decades ago, and there were many people who would attempt to do the wiring in their own home to save some money. It is not uncommon to see exposed live wires or incorrectly wired homes from the 80s and earlier. These wires, though they may not have caused a fire up to this point, are basically a ticking bomb. It is important to have your home expected by a professional electrician so you can avoid having to go through fire damage restoration. As the days start getting colder in Chippewa Falls, you might be tempted to build a fire in the fireplace of your new home. However, if you live in a previously lived-in home, you should have your chimney cleaned first. Having a blocked chimney can cause smoke and debris to come into your home rather than up and out the chimney, and that can lead to fire damage. Even if you don’t have an actual fire in your home, smoke damage to your home can require that you hire a fire damage restoration professional. Hair tools: If you use a curling iron or a straightener, you know just how hot they can get and have likely burned yourself a time or two. It is a good idea to unplug these appliances completely after you are done using them, so you don’t accidentally start a fire. Many times people will forget to turn them off, so it is helpful to remember to unplug them all the way. Dryers: You might not have ever considered that dryers can cause fires, but they actually are the cause of a lot more fire damage than you realize. Leaving a dryer to run its course is something most of us do, but you should never leave the dryer running while you are out. Cleaning out the lint filter regularly can reduce the risk of fire. Ovens: Some people use the timed bake setting on their oven to start cooking a meal to be ready when they get home from work or an event, but that can be very dangerous. You should never have an oven on while you are away from your home. 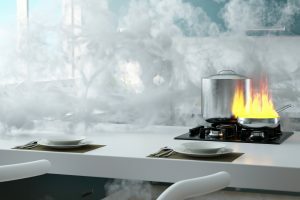 Opt for a slow cooker meal instead, they have less potential for causing fire damage. There are many things that you can do to reduce the risk of a fire, but sometimes accidents just happen. If you are ever in need of a fire damage restoration professional in Chippewa Falls, contact TRAC Solutions immediately.